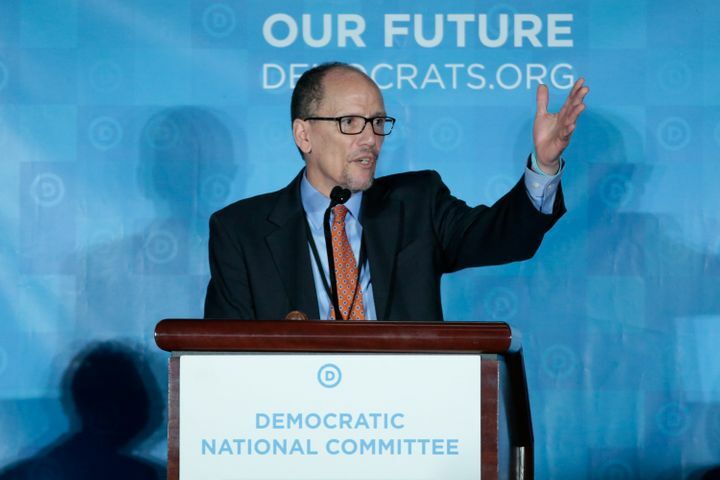 WASHINGTON Democratic National Committee Chair Tom Perez announced the complete list of people on the 21-member Unity Reform Commission on Monday. The panel was created at the partys national convention in July as a last-minute compromise between supporters of Democratic nominee Hillary Clinton and those of Sen. Bernie Sanders (I-Vt.), who were demanding the elimination of super-delegates from presidential primaries. The commission will now begin the process of discussing reforms to the partys presidential nominating process, including hot-button issues like the role of super-delegates and caucuses. It will present its recommendations to the DNC by January 2018. At the 2016 convention, Hillary Clinton, Bernie Sanders and national delegates agreed that in order to capture the energy of Democrats from across the country it is critical that we enhance the nominating process that continues to embrace the big tent of our party, Perez said in a statement. This includes everyone, from lifelong Democrats to 18-year-olds who cast their first ballot in 2016. A Democratic Party that gives every Democrat a voice in the process will make enormous gains from the school board to the Senate this cycle and it will take back the White House in 2020, he continued. We already see this incredible energy in a number of highly competitive races across the country. The 21-member commission includes nine members selected by Clinton, seven members picked by Sanders, three picked by Perez, and the chair and vice chair selected by Clinton and Sanders, respectively. Aside from Chair Jen OMalley Dillon, a Clinton pick, the breakdown of themembers selected by Perez and Clinton is not public. Sanders had also already named his selections to the commission. They are Cohen, the vice chair; former Ohio state Sen.Nina Turner; former Sanders campaign manager Jeff Weaver; former Sanders New York delegate Nomiki Konst; Jim Zogby, founder of the Arab-American Institute; former Berkeley, California Mayor Gus Newport; former Nevada Assemblywoman Lucy Flores; and Nebraska Democratic Party Chair Jane Kleeb. Democratic National Committee Chair Tom Perez announced the complete list of members of the Unity Reform Commission on April 17, 2017. Members of the Democratic Partys progressive wing, particularly those who backed Sanders insurgent candidacy, eagerly await the commissions deliberations. Many Sanders partisans accuse the DNC of skewing the presidential nomination process against Sanders and other outsiders. Super-delegates, or party insiders and elected officials free to support a primary candidate regardless of whom their states voters backed, are a particular sticking point. Hundreds of super-delegates endorsed Clinton before Sanders even entered the race. Other issues include a primary schedule that critics charge with favoring well-funded candidates, the timing of primary debates, and the ability of independents to vote in states where primaries and caucuses are currently closed to them. One area of compromise might be the role of caucuses, the in-person meetings that some states use to elect their nominees. The gatherings often take hours and disproportionately attract party activists, which has elicited criticism that they are less democratic. Sanders nonetheless turned in some of his strongest performances in caucus states. Once the commission makes its recommendations for reform, it will be up to the DNC to adopt the commissions recommendations. While he was campaigning for DNC chair, Perez acknowledged the legitimate grievances of the Sanders faction at one point going so far as to imply the primary was rigged, before walking it back under pressure. He has had some rhetorical commitment to trying to bring the progressive wing of the party into the fold, said Rhode Island state Rep. Aaron Regunberg, a Sanders supporter who was on the Democratic National Convention Rules and Bylaws Committee. I see this as a good test of whether thats real rhetoric or not. A lot of people are watching to see if there is a genuine commitment to embrace the energy that has come from the progressive side of the party and step away from plutocracy. I dont have a crystal ball, but I gotta hope that we will. If we dont, I dont see us making the other changes that we need to win in 18 and 2020. Regunberg and other progressive reformers who wanted the Rules and Bylaws Committee to abolish super-delegates outright this past July are mostly taking a wait-and-see approach now that the commission is in place. We have a real opportunity to present a dynamic shift in the party and Im hoping that all the DNC Unity Commission members are on the same page about needing these real changes, said Nomiki Konst, a Sanders appointee to the Unity Reform Commission. We should take our job very seriously. Brian Ertz, an Idaho environmental lawyer and Sanders appointee to the convention Rules and Bylaws Committee expressed skepticism. Ertz voted against the compromise that created the Unity Reform Commission on the grounds that these commissions are where reform goes to die. The question is whether the DNC will adopt reforms that necessarily diminish and dilute the power of individual members. And I just dont see that happening. Im hoping Ill be wrong, but Im not counting on it, Ertz said,referring to the fact that all voting DNC members are super-delegates, among other potential conflicts of interest. The commissions first meeting will take place in Washington, D.C., on May 5-6. All of its meetings will be public. This article has been updated with more details on the commission and reaction about what it hopes to accomplish. Politics hurt too much? Sign up for HuffPost Hill, a humorous evening roundup featuring scoops from HuffPosts reporting team and juicy miscellanea from around the web.